We love counting down the days to big events and vacations at our house. The anticipation and planning is almost as exciting as the event and vacation itself. We've always done digital countdowns on our computers but Hannah is old enough now that I thought it would be fun for her to be able to help "mark" the days off. Plus it is a great way for her learn her numbers! We actually have two countdowns right now. 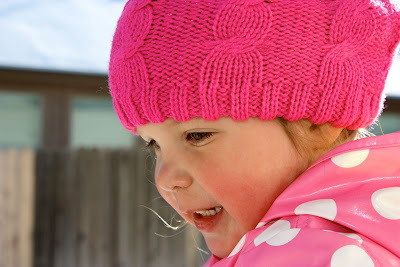 The first is that this sweet girl is going to be three next week! Birthdays are a big deal for her right now. We talk often about when all of the family birthdays are and she has been able to tell us her birthday is March 6 for several months now. 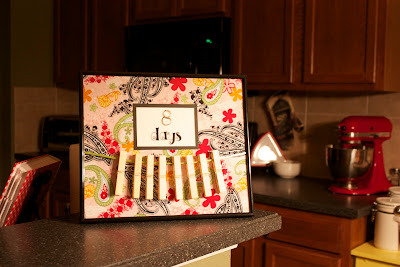 To help her know when March 6 is, I came up with this easy countdown. Every day we take off one clothespin, count the pins, and write the new number. 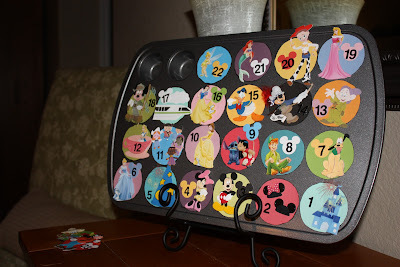 Our other countdown is for our next Disney Cruise. 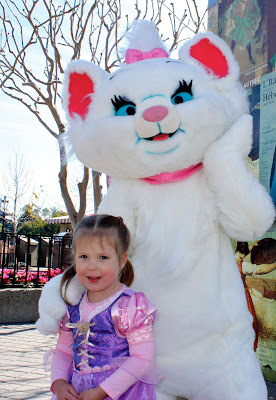 We are heading in a few weeks to Los Angeles to cruise the Mexican Riviera and for a couple of days in Disneyland. We are excited about this trip because it has no "business meetings" and is all fun. We are also really excited because Mamaw and Granddad (my parents) are coming with us this time! I had so much fun making this countdown. It is a mini-muffin tin with magnetic circles. Every morning, Hannah takes off one circle to reveal a little treat like a few M&M's or mini-Vanilla wafers. As she gets older, I plan to include clues about our upcoming vacation like the resort we are staying at, if we are going on a cruise, etc. Hannah loves taking off one circle! She jumps out of the bed in the morning and runs to it first thing. Sometimes the promise of taking off a circle is the only thing to get her out of bed in the mornings. I also made Christmas circles to use as our advent calendar. We have a big week coming up! We are heading to Oklahoma Christian for Spring Sing to watch my sister in the Freshman Show. Their theme is Blue's Clues. I am also excited that my Gamma girls chose Minnie Mouse this year for their theme. So appropriate! 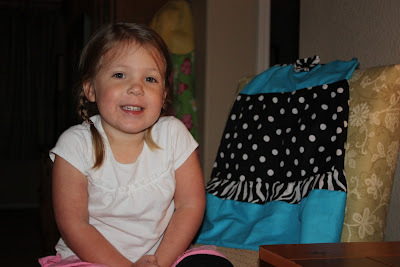 Our girl is also turning three. For her birthday, my mom is taking Hannah (and me, too!) to the American Girl Store in Dallas. More on that soon! "Turn around, turn around, turn around..."
Last night, we took Hannah to see these guys, the Imagination Movers. For those of you without little kids, they are a band that play kids' music with a rock edge. Meaning they play kids' music that Mom and Dad actually enjoy listening to! The Imagination Movers also have a tv show on the Disney Channel where they play their songs and use their imaginations to solve problems. Hannah loves the Movers and we do, too! We were already impressed with them and their story, and were even more so last night. We loved watching the guys come out into the audience, not afraid to dance and interact with the kids. We were also impressed that they ended their concert with, "God Bless." Hannah had a great time at the concert! She was a little star-struck for the first half, but really got into the music during the second half! 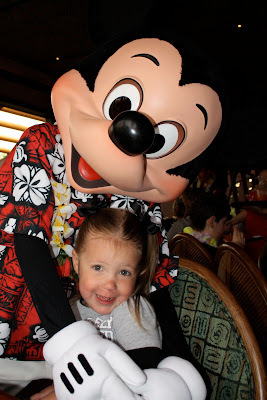 One of Hannah's (and Mom and Dad's) favorite things to do in Walt Disney World is to visit the characters. 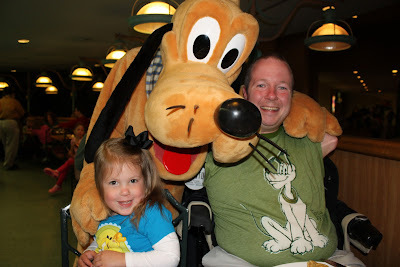 We love planning meals with them so we can spend more time with them without having to wait in line! 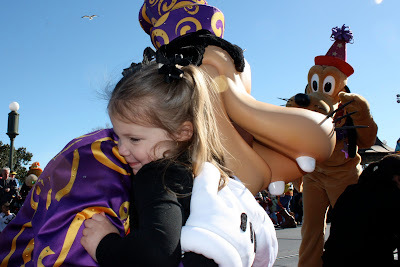 A hug from Goofy during the parade. Disney's newest character, Duffy the Bear. He is Mickey's bear that travels the world with him. 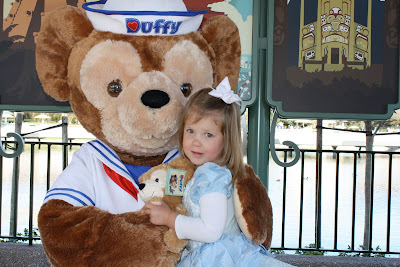 Thanks to Disney's marketing (and fun money from Nan and Pops), Hannah has her own Duffy now. Tell Flynn Rider to "Go Away!" 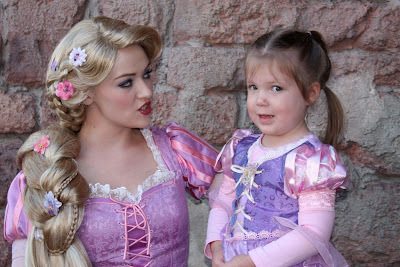 Hannah loves Disney's newest princess, Rapunzel, from their new movie, Tangled. She has the dress, several Rapunzel dolls, coloring books, and soon we will have the movie. So, of course, we needed to meet Rapunzel while we were in Walt Disney World. The Rapunzel Meet and Greet area is really cute! Several families are let in to the area at a time. 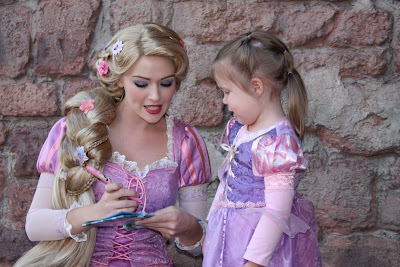 While you are waiting for Rapunzel to come, the children are invited to a large table in the middle where they can color a picture. 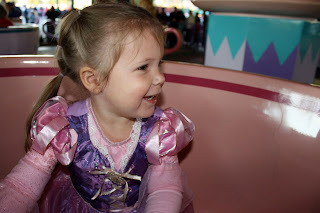 Then Rapunzel comes out with Flynn Rider and they dance around the table with the children. Then it is time to meet Rapunzel and Flynn! 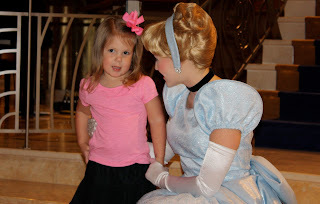 Hannah has a thing about meeting the princes and other boys. She won't go near a princess if her prince is with her. She won't talk to Aladdin, Peter Pan or the Mad Hatter. 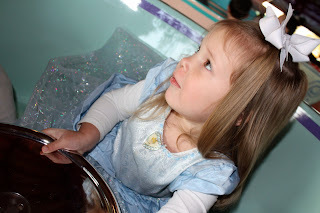 Hannah so wanted badly wanted to meet Rapunzel until she realized that Flynn Rider would be there with her. 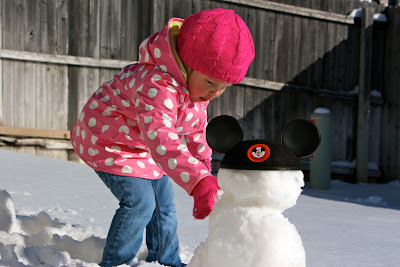 After waiting for over an hour to see her, we wanted to this to go smoothly (and she was wearing her Rapunzel dress!). 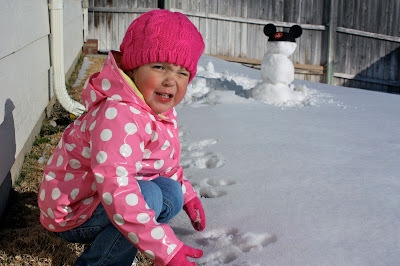 Thankfully, the cast members understood and had Flynn hide behind a gate when it was Hannah's turn. Hannah had her eyes closed until we told her that he was gone. 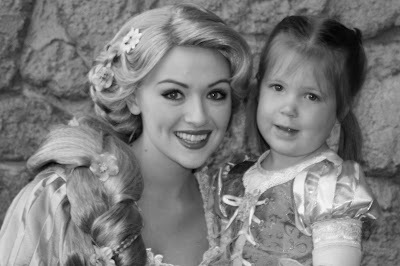 She opened her eyes and ran to Rapunzel! Because of our status with the Disney Destinations as travel agents, we were invited to their annual Earmarked conference. 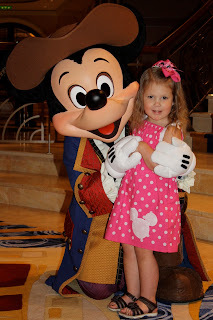 This year was even more special because it was held on Disney Cruise Line's newest ship, the Disney Dream. Our cruise was a preview cruise. The Disney Dream is a beautiful ship with many magical touches that you can expect from Disney. Hannah and I had a blast exploring when Chet was in his meetings all day. 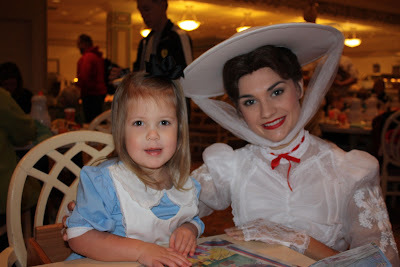 Hannah loved the Enchanted Pictures that were scattered all over the ship. 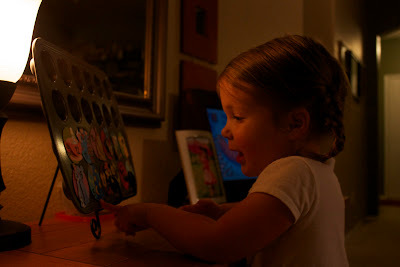 The pictures come to life when you wave your hand, animating the picture in the frame. In this photo, the picture comes to life and you can drive the ship to find the treasure. Dancing at the Sail Away Party. Since we were on a preview cruise, the ship wasn't full so the lines weren't as long. 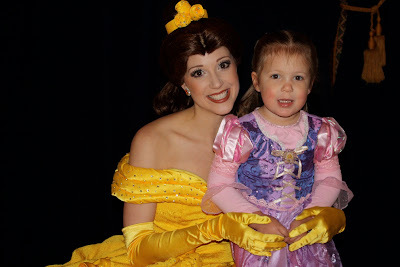 We got to see all of the princesses twice! Since Hannah isn't quite three, she wasn't able to visit the kids' club by herself yet. 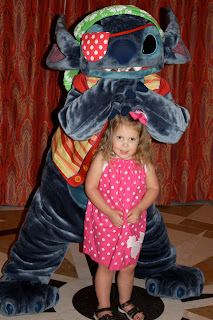 The nice thing about sailing with Disney, is that we can visit the clubs with her anytime we want as long as we stay with her. 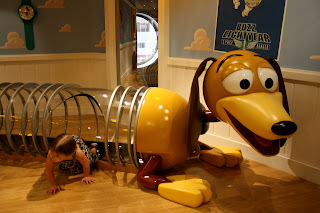 Hannah loved climbing on Slinky Dog and putting together the giant Mr. Potato Head in Andy's Room. 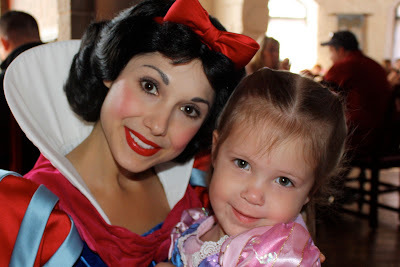 She dressed up as Snow White in Pixie Hollow and played with the monsters at the Monster's Academy of Monster's Inc. Belle even came to play with the kids in the club while we were there. Oh, to be a kid again! 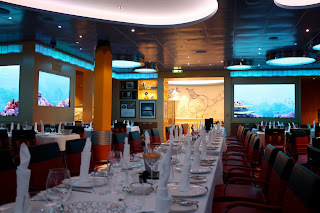 Our favorite restaurant on the ship was definitely Animator's Palate. The decor is inspired by an animator's desk. During the meal, Crush the turtle from Finding Nemo swims around the restaurant interacting live with the guests. Hannah still talks about eating with Crush. 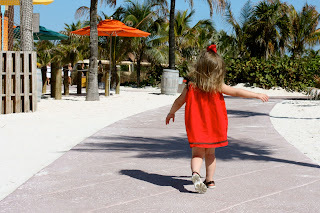 Enjoy our day at the beach on Disney's Castaway Cay. 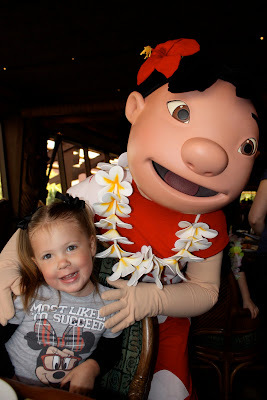 Hannah was so cute with the characters this trip. 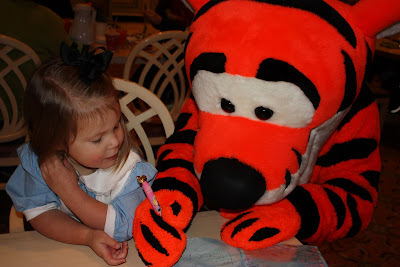 This was the first trip that she wanted all of the characters to "sign their name" in her autograph book. She'd hold open her book and run to the characters as soon as it was her turn. 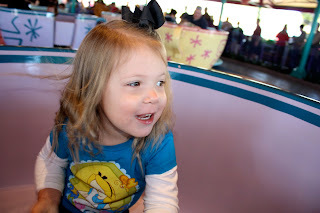 On our recent trip to Walt Disney World, Hannah discovered a new favorite ride... the Mad Tea Party tea cups! We had avoided it until this trip, but she spotted them and told us that she wanted to ride. Luckily, for Mom and Dad, Hannah can only spin the wheel a little bit at a time. 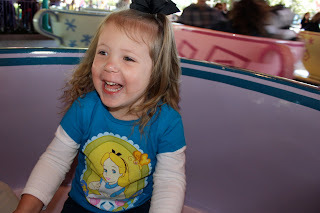 A little bit of dizziness is totally worth it to listen to our little girl giggle and squeal as we whirled around! 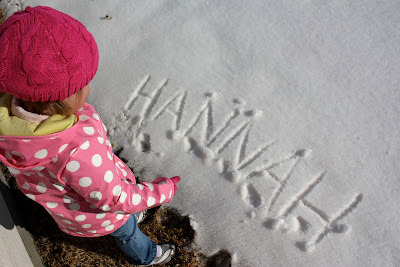 Chet and I reflected this trip about how much our trips have changed since Hannah was born. 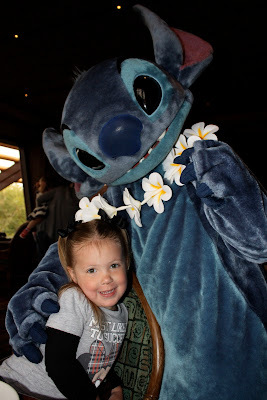 When it was just the two of us, we'd sleep til 11:00 and stay at the parks until midnight. The thrill rides took up most of our itinerary and we'd eat at the restaurants that maybe weren't so kid-friendly. I love those trips that I took just with my husband, the time that we shared together and the memories that we made. Now, as parents, we are loving this style of vacation just as much. We mostly allow Hannah to tell us what she wants to do. We are usually out of bed and in the parks by 9:00 am. 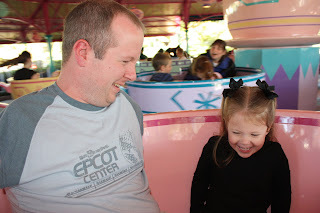 Our itinerary is mostly spent in Fantasyland at Magic Kingdom riding "it's a small world," Dumbo the Flying Elephant, and Mad Tea Party. She has us riding attractions that we had never experienced. 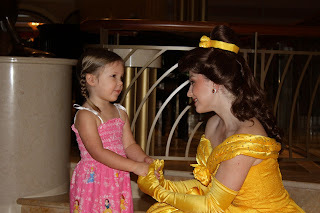 We eat breakfast with the princesses and dinner with Mickey. 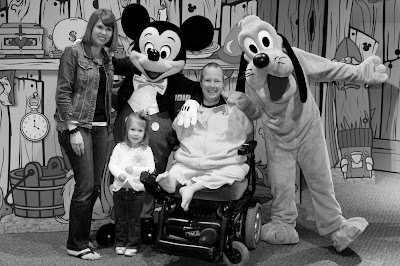 We love sharing these experiences with her and making new memories.